Expert Rattlesnake removal, relocation, and prevention, snake safety education, snake fencing. Teaching cub scouts about snakes & rattlesnake safety. Bo loves giving back to the local communities in which he serves! Bo is available to give safety clinics to schools, clubs, camps, HOAs, businesses, civic groups, or any other group who wants more information on snake and rattlesnake safety, identification, and prevention. Bo speaking at local community business leaders luncheon. 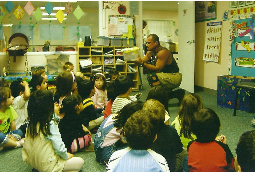 Bo teaching special needs children and their parents about rattlesnake safety. Pre-event clearing and supervision for outdoor events and parties. Bo supervising a kid's Halloween Party at one of his client's ranches. Bo at the beach...teaching kids & families rattlesnake safety at Paradise Cove! Throughout Bo's years of experience, he's been called out on high-profile jobs, including filming locations, rehab clinics, celebrities' homes, and even military installations. But he makes it a point to serve everybody. "When I get clients like little old ladies with a fixed income and a rattlesnake under their trailer, I come in and charge them a sandwich and a cold glass of water."